Orchid, Orchid who has an Orchid? Potted orchids are no longer the rare exotic plants that they used to be and most garden centers now stock them. A few inexpensive materials and a little time will create a stylish container to show these lovely flowers at their very best. Orchids do not like to stand in water but they do like a humid atmosphere. A layer of gravel underneath the pot acts as a reservoir for excess water which creates humidity. 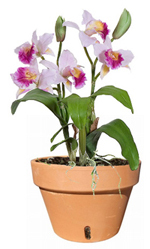 The potted orchid will also benefit from being sprayed with water with a fine mist. Plant these lovelies any time of year. There are many types of planters made specially for orchids. The sides of these pots have holes in them for air circulation. These extra holes really help with the root system of the orchid and are the best chance you have of gardening success. Arizona Pottery sells a number of orchid pots. Some in terracotta others in glazed ceramic. Just go with the one that you prefer for looks and follow a few simple tips. Pour a one inch layer of gravel in the base of the pot to help with drainage and line the pot with moss. Tip the orchid over in the nursery pot and gently remove it. Place on the moss in the garden pot and fill in around it with more soil. Do not pack it down. Cover the top of the plant with more moss. You can push a small reed or garden stake into the soil and then use some string or raffia to tie the plant to the stake. This helps with stability so the orchid doesn't droop off to the side. Give it a good water and your good to go. Enjoy!